Photo by Melanie Risch, 2018. The "Tall House" – where Joe lives. Photo by Christopher Risch, 2017. This is the new yurt, also known as the Open Yurt. We like to keep this space open to those in need of quiet meditation... our most popular yoga spot. The pavilion houses our library and herb shop, both of which are open to the public Monday through Saturday 9-5. Joe's extensive library of permaculture, plant ID, Western and Chinese herbal medicine, and other books are available for on-site public perusal. Our herb shop is also open to the public, and features countless single herb and Chinese formula tinctures. We also have a fully stocked Chinese herb dispensatory, with labels that detail their medicinal actions. Here in the herb shop, we fill prescriptions for our local acupuncturist, Margo Rossi. Photo by Lauren Lightbody, 2017. Photo by Lauren Lightbody, 2018. The very first structure to be built at Mountain Gardens, the Yurt is over 40 years old. It is one of our apprentice dwellings. 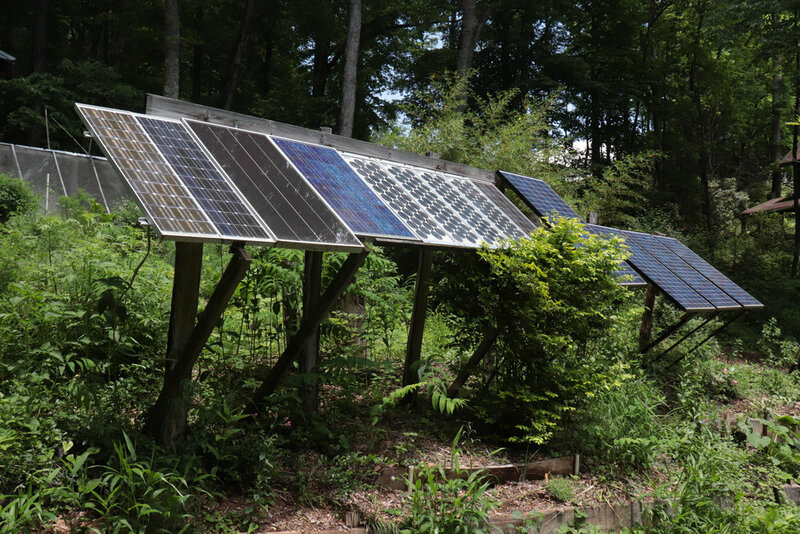 Our "museum of solar technology," we like to say. We are off-grid and all of our electricity comes from these panels. Additional panels power the Tall House, the Coop and the Dome. Our tool wall was built from cob slip-straw, and plastered with cob and lime in 2017.